The typical appeal of a Johnny Depp film is to see what strange, odd or just downright weird concoction of a character the actor has come up with next, but with Transcendence the appeal for me has always been to see what Depp does when asked to play a regular guy. He's done it before, this is nothing new, but he doesn't do it often and the fact his role (in a physical sense anyway) seemed limited to a short amount of the overall running time. Depp is still within his wheelhouse in terms of the type of person he enjoys playing even if the exterior is much more tame than the route he'd typically take, his role as Dr. Will Caster still sees him as a man of extreme intelligence and someone not looking to necessarily change the world as he likes to remind people, but instead always be discovering it, attempting to figure it all out. Despite this positioning Depp as the seemingly obvious star of the film, this is a movie that really belongs to Rebecca Hall. Depp is an influential presence and his character dictates the events in which Transcendence documents and even more he creates many of the questions the film intends to pose to the audience, but in terms of taking this as a piece of entertainment and in evaluating the performances of the actors involved this is Hall's film and it is her emotional investment in the plot of the film that makes this as compelling as it can be. The issue here though is that there isn't a clear line of thought in terms of emotional connection to the audience despite one of the major themes of the film being whether or not technology can develop feelings, affection, fear, etc. or if the thought of artificial intelligence will remain only that: a database of intelligence and nothing more, nothing trying to imitate the inherent nature of primitive life. Though this is somewhat ironic it is hard to fault the film for trying, for so deeply wanting to be something more, something thought-provoking. That is what I found to appreciate in Transcendence in that this wasn't simply a film that ordered itself into a certain set of rules or restrictions, but instead a piece of fiction that wanted to both discuss interesting ideas while at the same time providing an entertaining thriller/action film. This coming from Christopher Nolan's long-time cinematographer Wally Pfister I expected nothing less than that kind of melding of fantastical, large scope ideas and the architectures that match those in cinema, but while Pfister and screenwriter Jack Paglen have many interesting things to discuss here it seems they still need to practice funneling those ideas into a single coherent work. Dr. Will Caster (Johnny Depp), his wife Evelyn (Rebecca Hall) and their fellow researcher Max (Paul Bettany). We meet Dr. Caster (Depp) and his wife Evelyn (Hall) as they look to find funding for a few more years from their investors by putting on display the work they've been doing and discussing the next steps they intend to take with the technology they are developing. Their colleagues include Max Waters (the always prestigious Paul Bettany) and Joseph Tagger (Morgan Freeman throwing out his casual academic charisma), but it is when Will takes the stage and begins going on about the possibility of building a single computer with knowledge greater than every single individual on earth combined a few select members of the audience begin to ask questions. "You're talking about a God," one of them queries to which Dr. Caster replies, "has man not always tried to create its own Gods?" I sat up in more attention at this statement as it is an immediately intriguing concept. Are we not just evolving in the way we look and have adapted to the land, but the way in which we think, create our mythology, our comfort, our own reason or justifications for things we cannot explain? We would have to be, right? It makes you curious, but it takes someone with the intelligence of Caster to test these curiosities and see if turning them into a reality is possible and further, if it is possible, are they for the betterment of mankind or only a stepping stone in creating another corruptible power figure. There is a group that doesn't intend to let Dr. Caster test these possibilities though and have labeled themselves as Revolutionary Independence From Technology or R.I.F.T. and feature players like Bree (Kate Mara), Joel (Cory Hardrict) and James (Lukas Haas) and it is when one of these anti-technology extremists aims a bullet at Dr. Caster in an attempt to stagnate the good doctors ideas and progress that they inadvertently give rise to him becoming a part of his own experiments with what he has labeled as transcendence. This idea of uploading Dr. Caster's brain into this super-computer is essentially creating a program out of his consciousness, but is this done in the name of desperation or innovation? That is the question Evelyn and Max become split on and where this leads is honestly kind of unexpected and it never becomes obvious along the way as to what conclusion the film is trying to draw, but unfortunately it never finds a momentum to grab the audience that takes us along on this journey with a high level of intrigue. 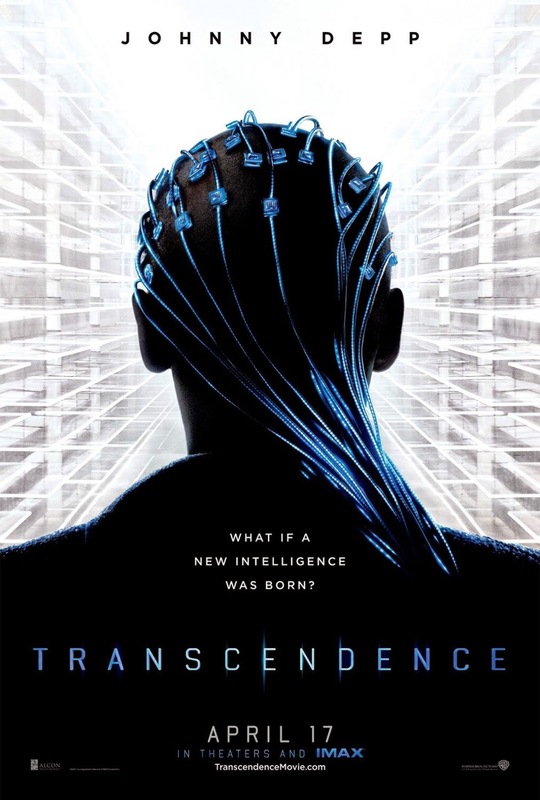 There are many problems with Transcendence as a film, but these mainly have to deal with the cohesion of the story and the ideas by first time screenwriter Paglen as well as the editing that seems to have no idea whatsoever about how to form suspense out of the content they were given. In both cases it boils down to the core issue in that the film wants to explore so many ideas and so many different philosophies that it doesn't know where or how to link these multiple thoughts together ultimately creating a mixed bag of empty- feeling ideas that are only skimmed over because they neither have the time to delve deep enough into a certain one or can't fit them together in a fashion where it both makes sense and provides an emotional payoff for the audience. This is usually an issue that comes up when in the early stages of writing and one is working out the flow of the narrative and the emotional anchor of what the story is ultimately trying to say, but it seems to have surpassed each incarnation of the script and somehow landed in the editing bay where David Rosenbloom (who is a seasoned pro and has this type of film down pat) seems to have little to work with in terms of building a complete picture that nevermind the fact it wants to make us think about things, but is hard pressed to even keep us amused giving way to the glaring truth about Transcendence in that it's a rather boring affair. It had me in the opening moments and I was ready to nestle down and become a part of this world, have a debate with those on screen in how they might be wrong or how I could see being an advocate for their work. I wanted more than anything to invest in this world where one could discuss for hours how if we don't put emotion into technology would technology then cease to inherit the emotion we for some reason want it to adopt? What about the fine line between intelligence and emotion? All these cautionary tales of pushing technology to the next logical step have always served as just that, but Transcendence wants to be more, it isn't a tale of man vs. machine, but a story of power vs. humanity that deals with the unforeseen consequences of our hopes and dreams, about re-generation, evolution and moreover the difference between what you can and what you should do. This is a vital aspect of the dilemma the characters in Transcendence come up against and yet for all these ideas and ambitions the film carries on its shoulders it ends up lacking the one thing its antagonist will never be able to artificially create, a soul. 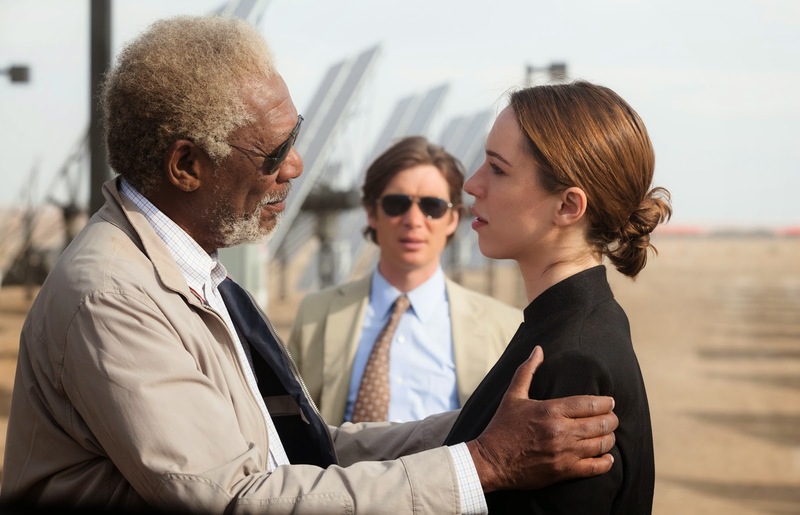 Tagger (Morgan Freeman) and FBI Agent Buchanan (Cillian Murphy) attempt to open Evelyn's eyes to the truth. Sometimes even critical issues such as these at the heart of a films story can be overcome if the performances given elicit that necessary spirit the narrative fails to create, but even here much of the well-seasoned cast is given little to do in terms of characterization because they simply exist to relay the plot points to the audience and make philosophical statements that relay the intended themes leaving little room for them to become actual individuals. As I said in the beginning this is really Hall's film and she is a fine actress that is more than capable of carrying a picture like this on her shoulders as she's demonstrated in The Town, Iron Man 3 or even Everything Must Go and Vicky Cristina Barcelona. All Hall is required to do though is weep over Will's death and then play the disillusioned widow who will do and risk anything to have her husband back even if it is nothing more than an illusion of what he once was. That sounds meatier than it turns out be as much of what Hall does is walk through hallways and look on in amazement as Will's AI grows more and more powerful, more and more like a God. As for Depp this isn't so much a performance as it is a test in how much he can do with his voice. He is asked to sound like a typical, middle-aged man from the East coast yet his timbre and choice of inflection is clearly calculated in a way that foreshadows his intensity once he becomes this all-consuming machine. What is really disappointing though is the rest of the cast who simply stand around and do almost nothing. Bettany, for all his talent and diverse ability is given less to develop here than he had in either Legion or Priest as at least in those he had some type of over the top need for vengeance or vindication, but here he is our source into the story and yet we never feel like we come to know him. We understand he is the one scientist who is unafraid to display his hesitance in creating a sentient with a full range of intelligence and emotion, but that is only because Kate Mara tells us so. Mara, Cillian Murphy, Clifton Collins Jr. and Freeman all look equally bored and what is most unfortunate about all of this is that Pfister likely won't be returning to the directors chair anytime soon. Like Andrew Stanton who went big and then went home after his first live-action feature bombed Pfister shot for the moon with Transcendence, but at least the guy had the balls to set his sights that high and do something most don't even care to attempt in the current state of cinema. Transcendence isn't nearly as bad as you've likely heard and it has some visual moments that are truly striking; regrettably, those small highlights won't matter much given this isn't anywhere near the first impression everyone was hoping for from Pfister.